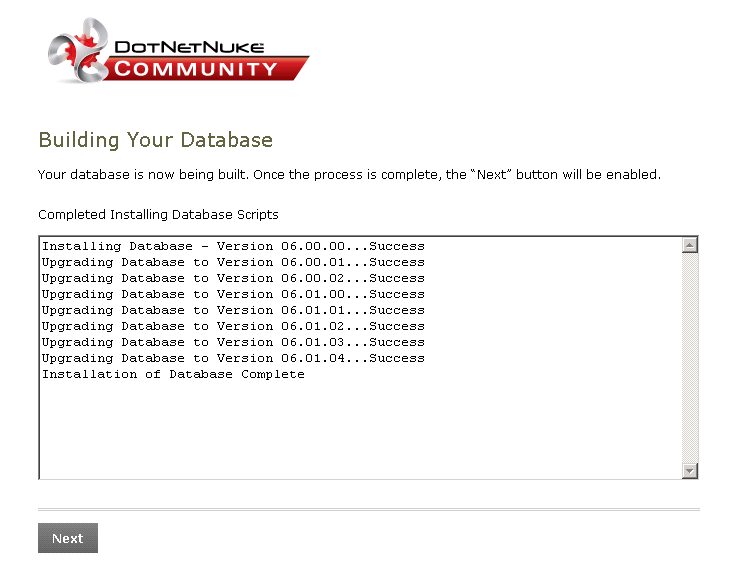 In Part 1 and Part 2, I've explained how to download and install the DotNetNuke .NET application, configure System Center 2012 Operations Manager (SCOM) Application Performance Monitoring (APM) and detailed the creation of an APM monitor that will allow us to deep-dive into the application for troubleshooting and performance data. 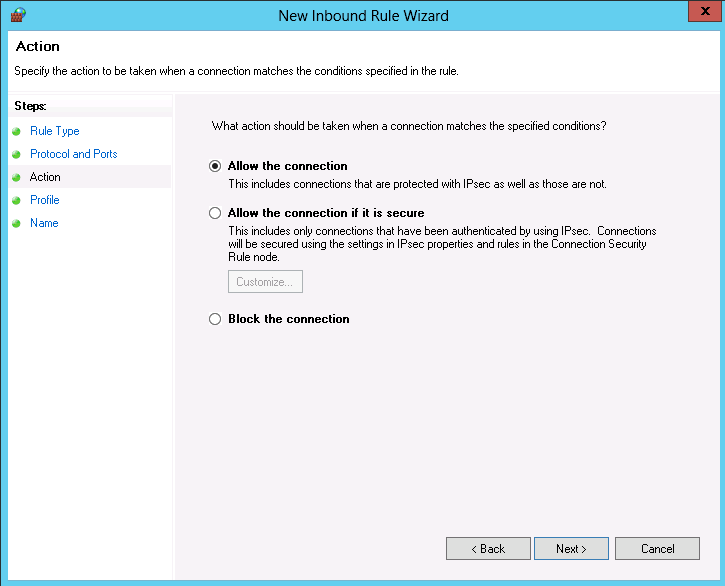 You will need to review both of these previous posts before continuing with this one as they form the foundation for configuring SCOM APM. 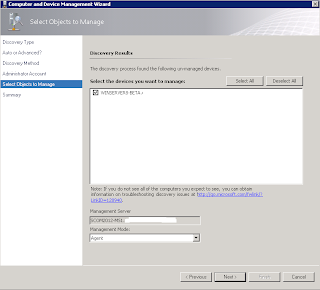 It is also presumed that you have the SCOM Web Console with the APM Application Advisor and Application Diagnostics features deployed onto one of your Management Servers. 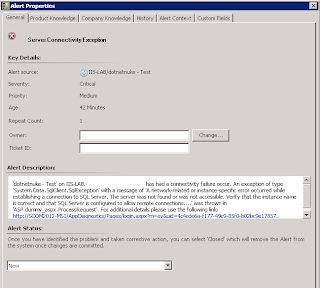 In this final blog post of the series, I will discuss the Client-Side Monitoring configuration of APM and will show how to generate alerts within your demo/lab environment to test the APM features of SCOM. 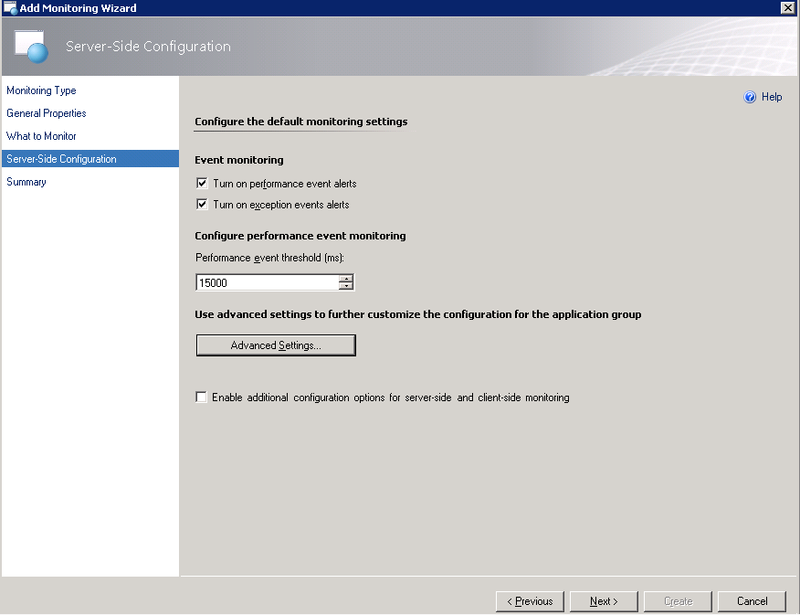 Click on the Monitoring tab on the SCOM console wunderbar, expand the Application Monitoring folder and then click on the ASP.NET Web Application Inventory view to see your applications listed. 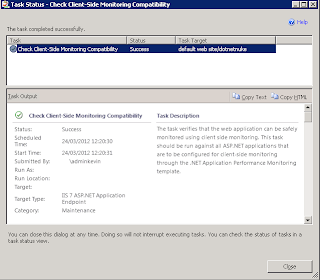 We can use the ‘Check Client-Side Monitoring Compatibility’ task from the Tasks pane on the right hand side to verify that the web application can be safely monitored using client side monitoring. 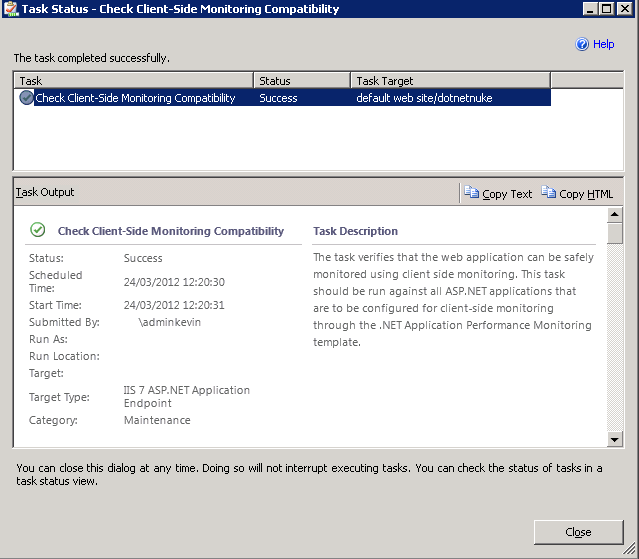 Once we have a successful return from the Client-Side monitoring compatibility task, we can then go ahead and add the client-side monitoring feature to the newly created APM monitor. 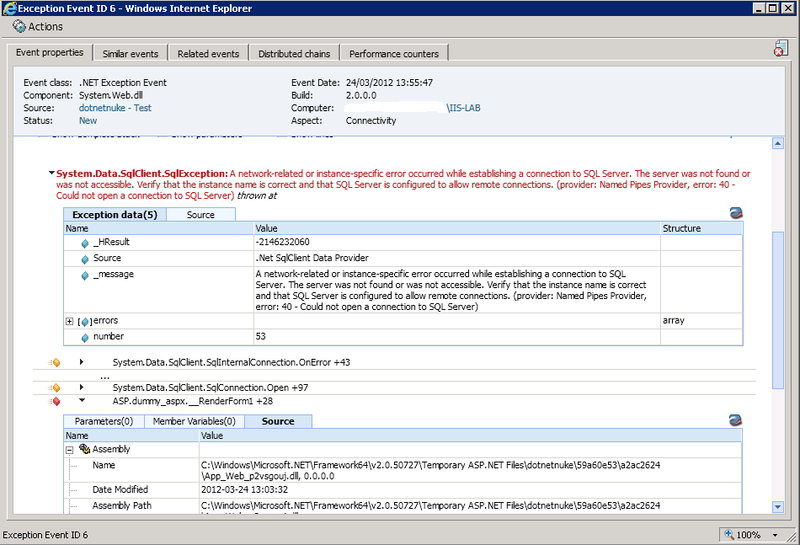 Once you are happy with your changes, click on the OK button twice to return to the main SCOM console. 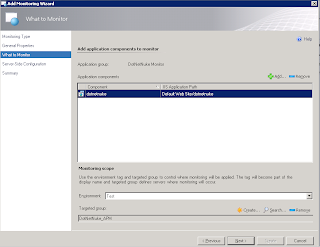 This will now enable some additional views within the Monitoring tab of the console and we can click back over here to take a look at what we have now for our .NET application. 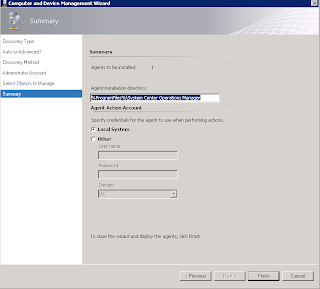 With this knowledge, it’s a good time to logon to your IIS server that is hosting the .NET application and take a look in the ‘services.msc’ snap-in and you will notice that the ‘System Center Management APM’ service is now Started and set to Manual. 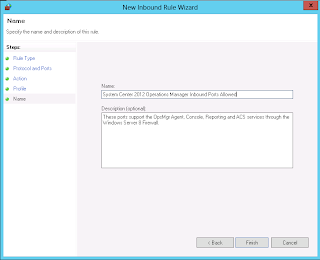 This service is installed by default as Disabled and only changes to Started when you configure the Client-Side monitoring functionality of SCOM APM. 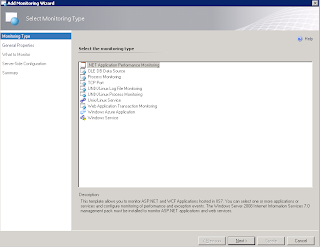 So, what do you do if you have followed the steps in these posts to the letter and have configured your APM perfectly but there are no issues within your application to test if your setup is working or not? 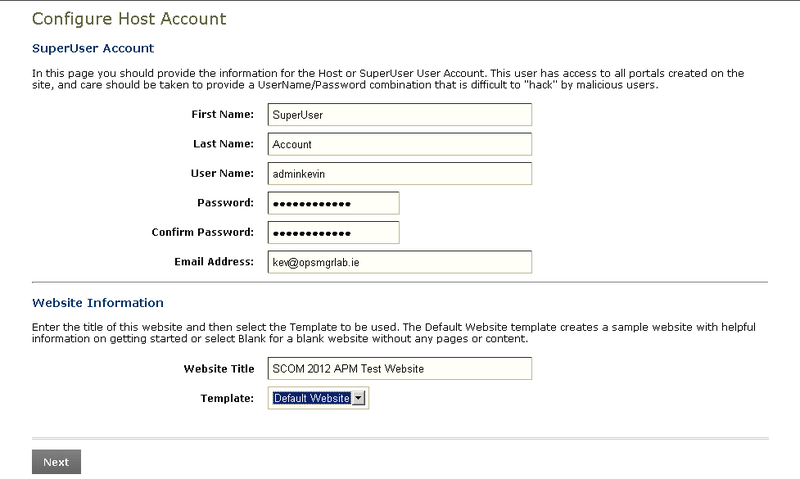 Simple, we create a bogus page within our application that when called on, will throw up an error for SCOM APM to deal with! 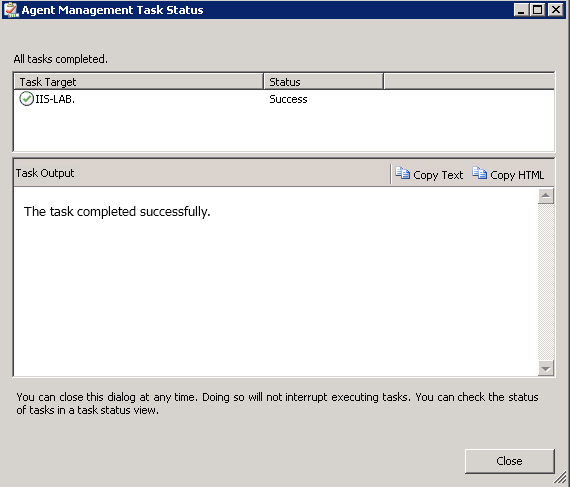 This concludes your configuration of the APM feature in System Center 2012 Operations Manager. Although we've covered a lot in these three posts, there's still a huge amount that wasn't talked about. 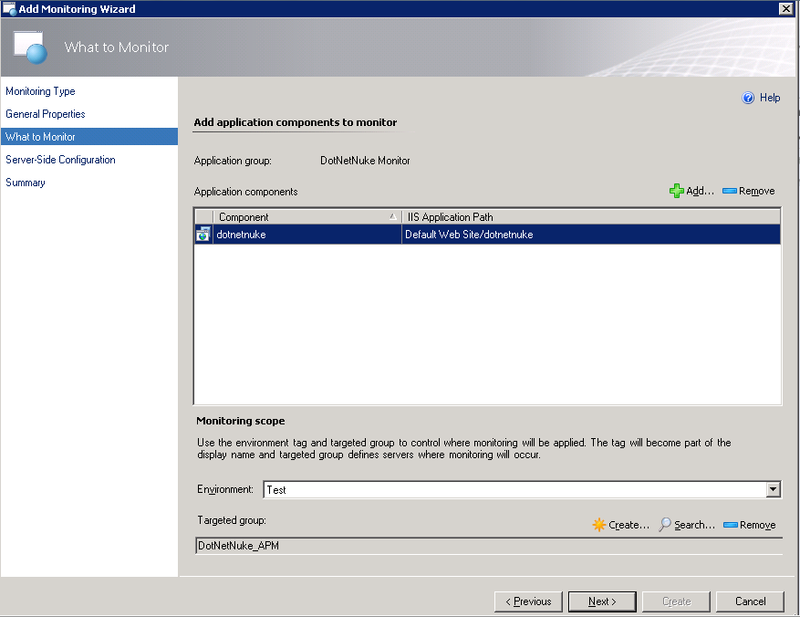 If you've gotten to the point where you have APM working and at least a demo application being monitored, then you will be in a great position to explore deeper into the different thresholds and customisations that are available for your application monitoring. 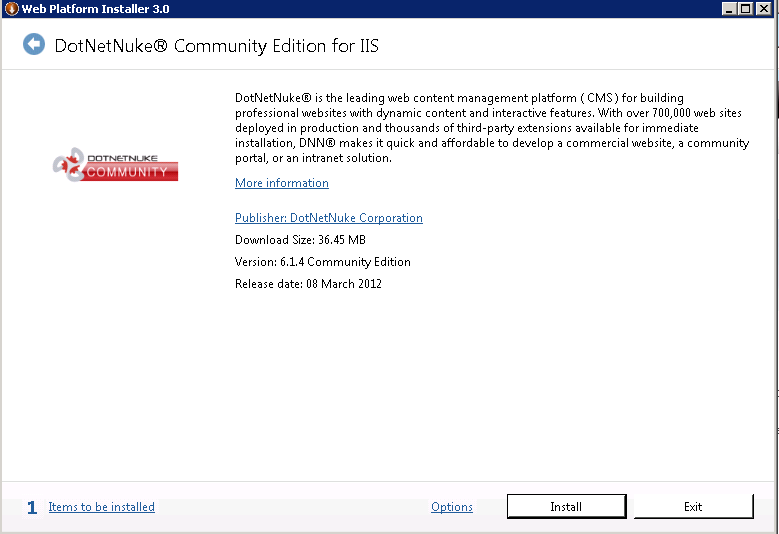 In Part 1, I walked through the process of downloading and deploying the DotNetNuke application which is a free community .NET based website that we will be using for our testing of the Application Performance Monitoring functionality within System Center 2012 Operations Manager. 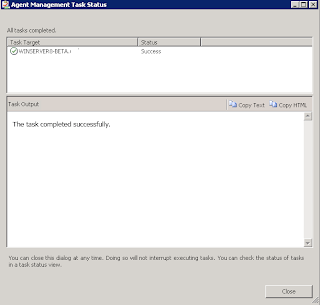 Once we have our .NET applications ready to be monitored, we now need to deploy the SCOM agent to the IIS servers that host them. 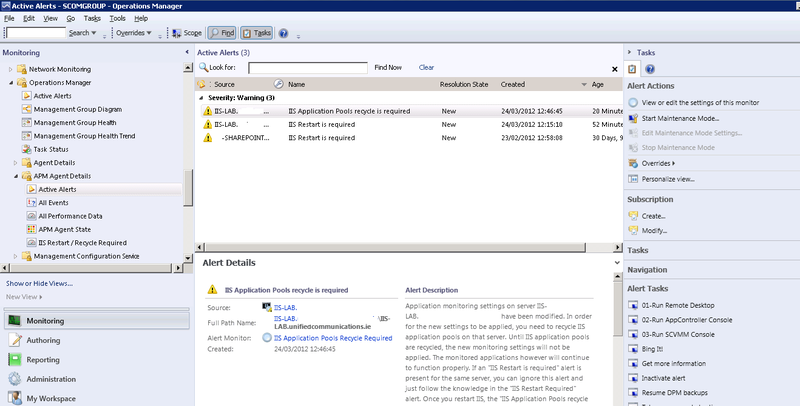 Note: The IIS 7 discovery rules are all set to discover objects after 14400 seconds (4 hours) and if you haven’t got the time to wait for these discoveries to occur, you can tweak temporarily the discovery rule for the IIS 7 ASP.NET Application Endpoint to allow full discovery of your application. 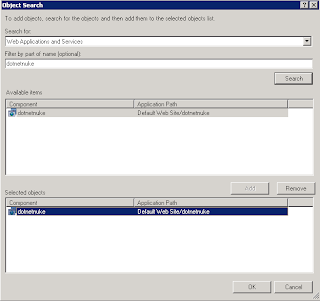 Without this rule being fired properly, you won’t be able to discover your app in the Web Application and Services object search later on. 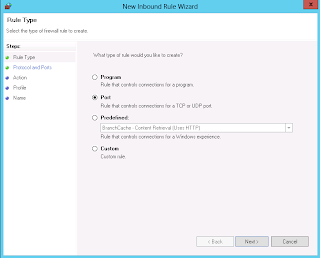 Move through the rest of the Create Group Wizard and click Create at the end to finish the process. 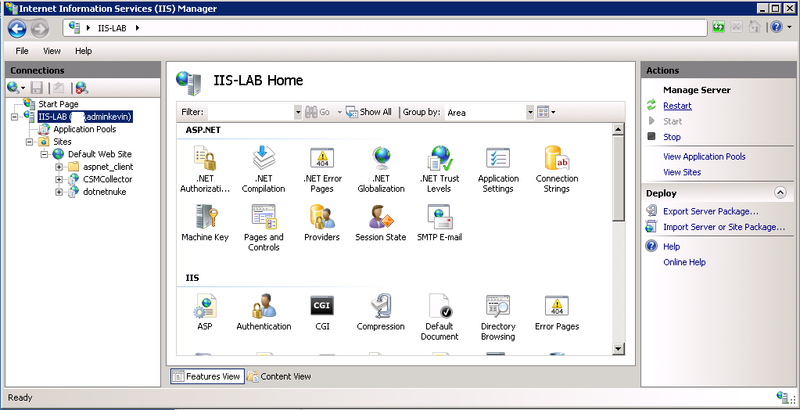 At this point, we have the .NET application configured on an IIS 7 server, we have deployed the SCOM agent to this server and ensured that the new .NET application and website have been discovered. 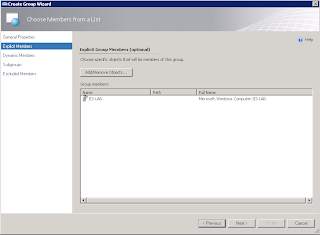 We have also just created a custom group and unsealed management pack for which we are going to save any customisations and rules to for this application. 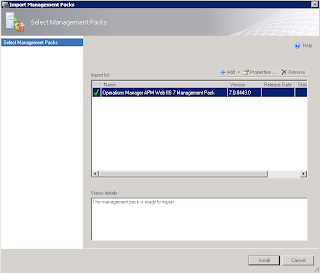 Note: If you haven’t imported the two management packs outlined in Part 1 of this series, then you will not be able to find your application in the ‘Web Applications and Services’ list here. 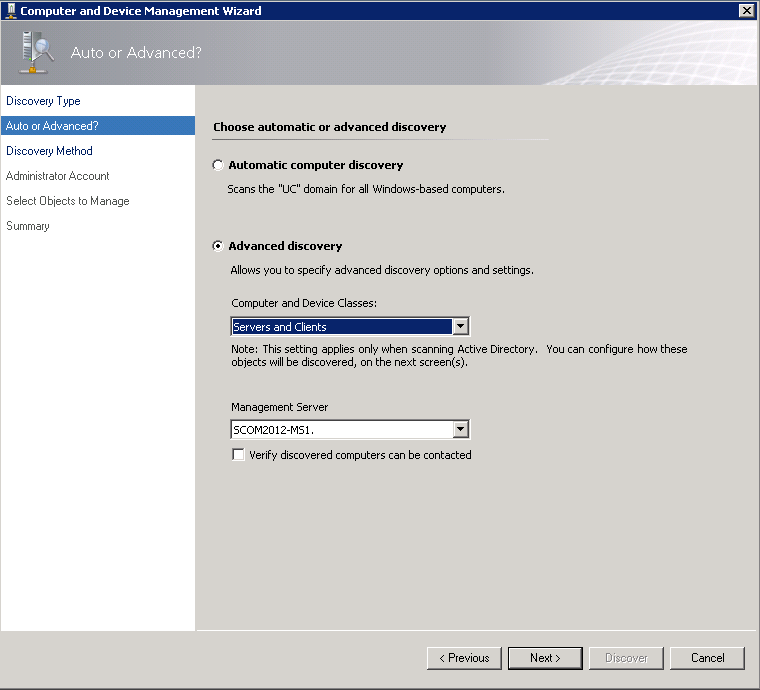 This is a common pitfall when people try to configure APM. 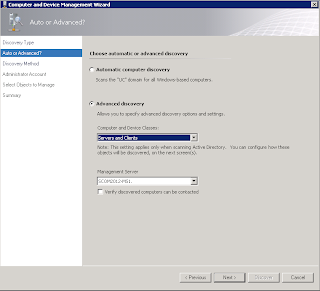 From the final screen in the Add Monitoring Wizard, you can review your configuration and then click on the Create button when you’re happy to continue. 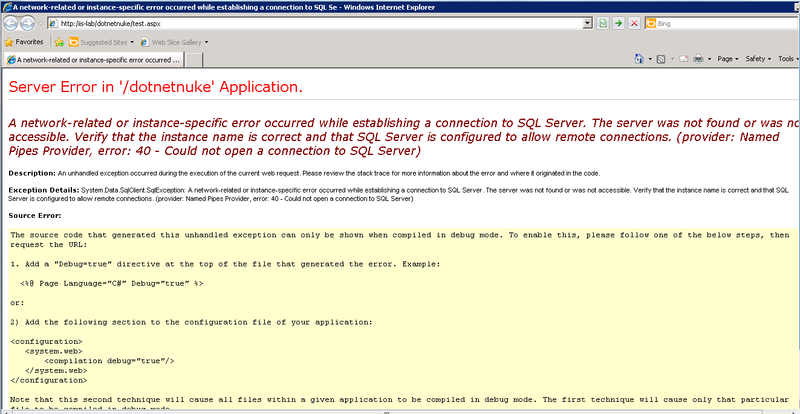 Note: You will see from the screen below that there is a warning message stating: ‘IIS may need to be restarted’. 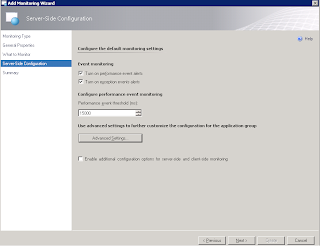 This is always a recommendation when you configure APM for your application and if you are working in a production environment, you will need to plan for this IIS restart after hours to ensure that your monitor works. 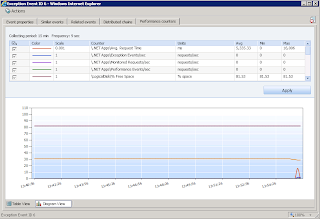 This completes the creation of your .NET Application Performance Monitor and you should be able to see your new monitor listed under the Management Pack Templates\.NET Application Performance Monitoring view. 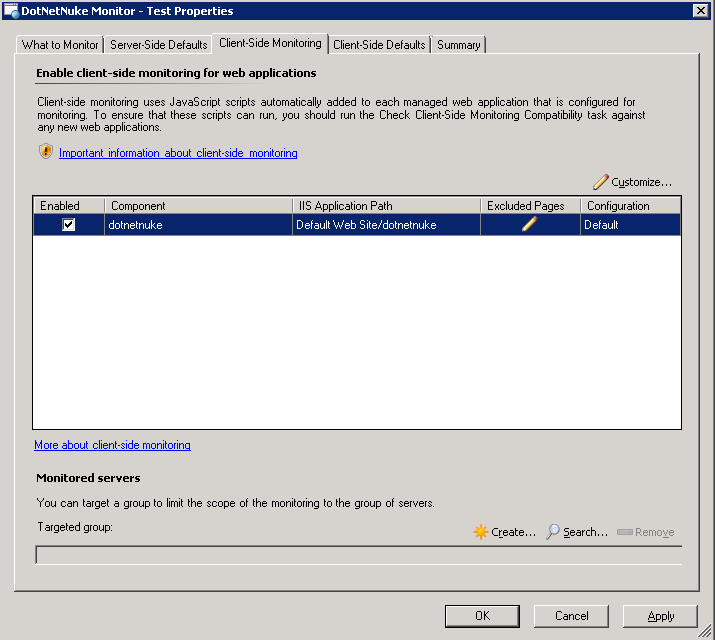 For Part 3 of this series, I will discuss Client-Side Monitoring and explain how to test your new APM monitor and review the alerts generated. 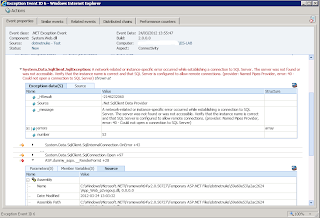 How often have you been in a position whereby a complaint comes to you about the slow performance of a .NET application and the development team are blaming the infrastructure team and the infrastructure team are blaming the development team? 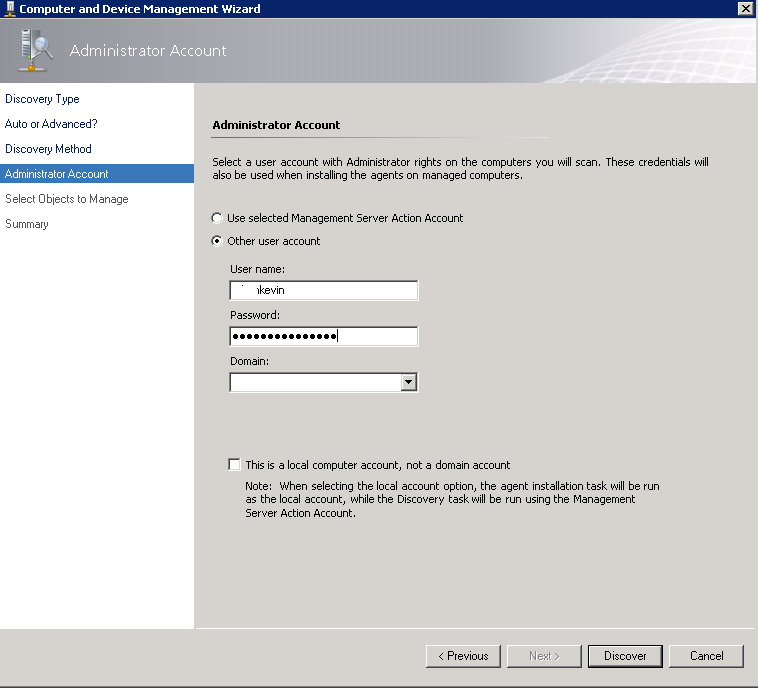 When a situation like this arises people look to you as the System Center Operations Manager (SCOM) administrator to find out what the problem is and to get answers quickly!! 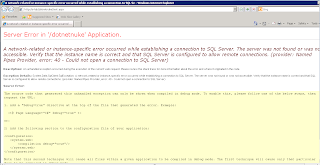 If the issue is related to infrastructure or the databases and Operating System that the application is running on, then SCOM will very quickly highlight the problem using the relevant SQL/Oracle, Windows/Linux and Network Monitoring management packs and functionality. 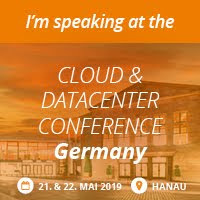 If the problem was not related to these technologies however, and was an issue with bad coding from when the application was developed for example, then you need to go much deeper with your investigations to find the root cause. 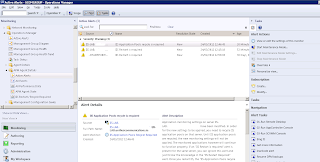 In SCOM 2007 R2, if you wanted to get this type of deep dive application monitoring, then you had to integrate with a product called AviCode. 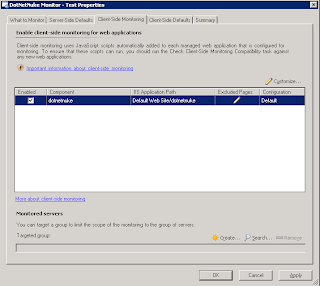 AviCode was the market leader in .NET application monitoring and in the year 2010, Microsoft acquired the company with a view to integrating it into a future release of System Center. 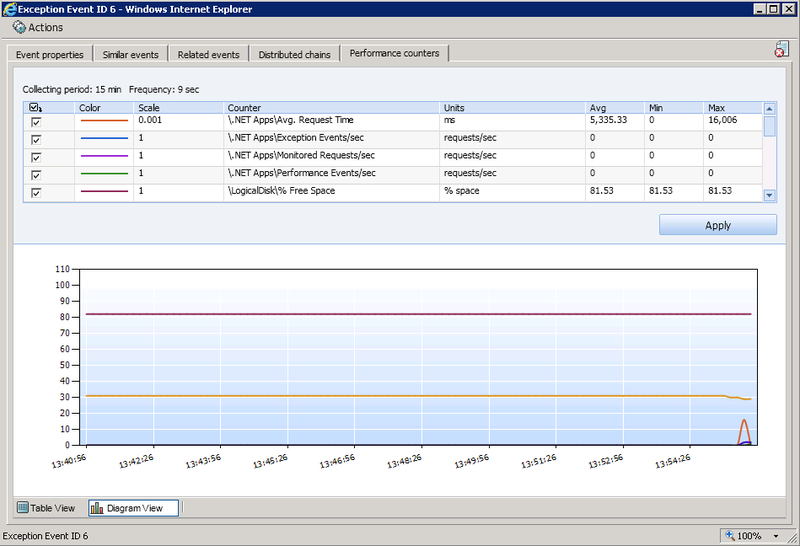 With SCOM 2012, Microsoft have integrated the AviCode product directly into it as the new Application Performance Monitoring (APM) functionality and it works really, really well for the type of scenario described above! 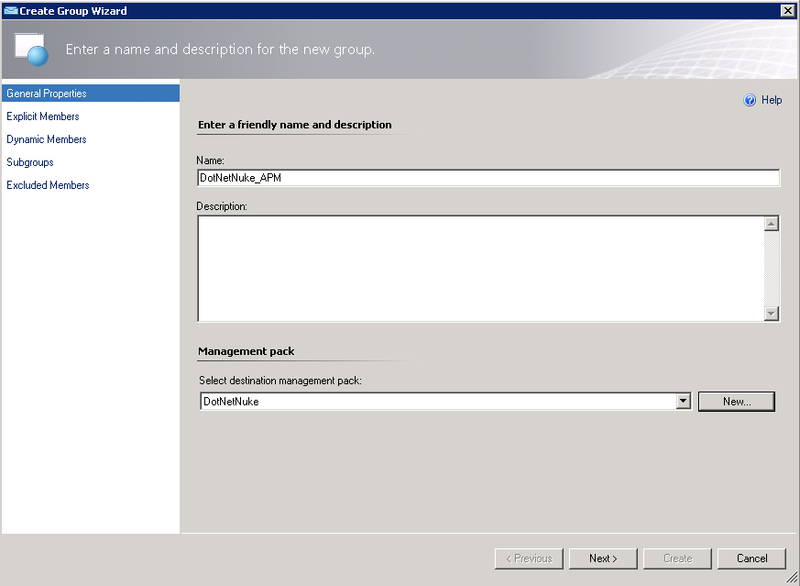 This three part blog series will describe what is needed to configure the APM functionality in the SCOM 2012 Release Candidate edition. 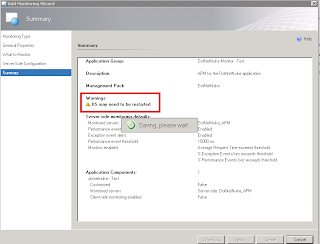 The Release Candidate of SCOM 2012 will support only .NET web applications and web services and not .NET compiled applications but this should be addressed in future updates/service packs. 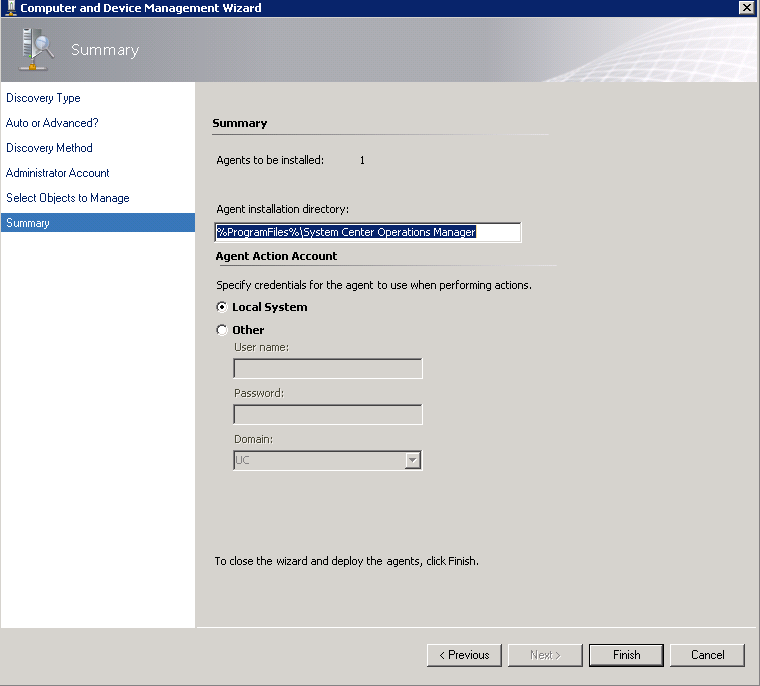 You need to ensure that you have installed the SCOM Web Console feature into your environment as this installation comes with the Application Advisor and Application Diagnostics features of the new APM functionality. 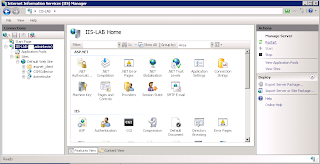 As a result of the web application and services monitoring functionality, only applications running on IIS7 will be monitored and we need to ensure that this management pack is deployed first and foremost. 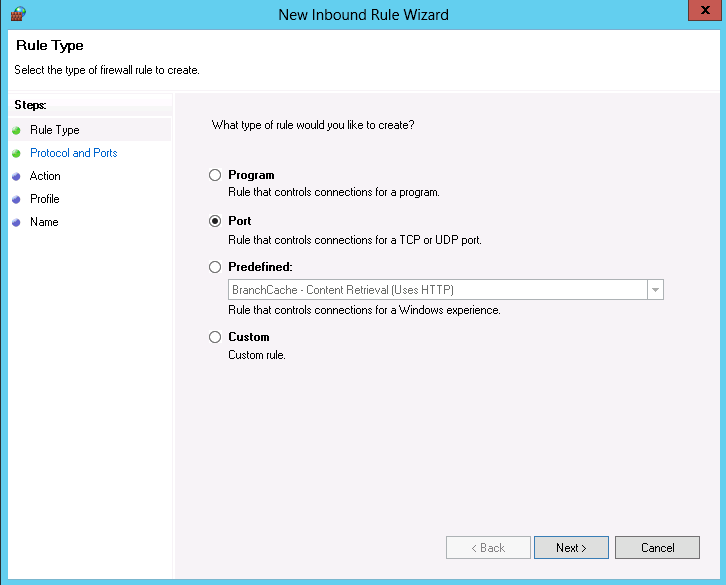 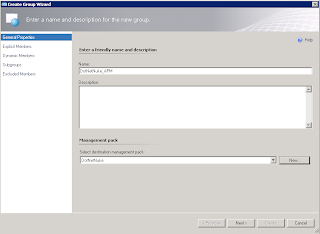 Once you have downloaded the IIS7 Management Pack, follow the instructions contained within the MP Guide to deploy it into SCOM 2012. 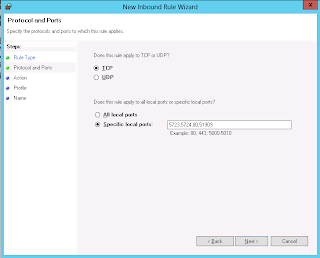 Note: It's worth pointing out here that, if you are reading only SCOM 2007 R2 references in the MP Guides and downloads, don't worry, these Management Packs all work fine in SCOM 2012. With the IIS 7 Management Pack deployed to SCOM, you then need to manually add one more management pack from the SCOM 2012 installation media - this is the only APM management pack that is not automatically installed on deployment of your first SCOM Management Server. 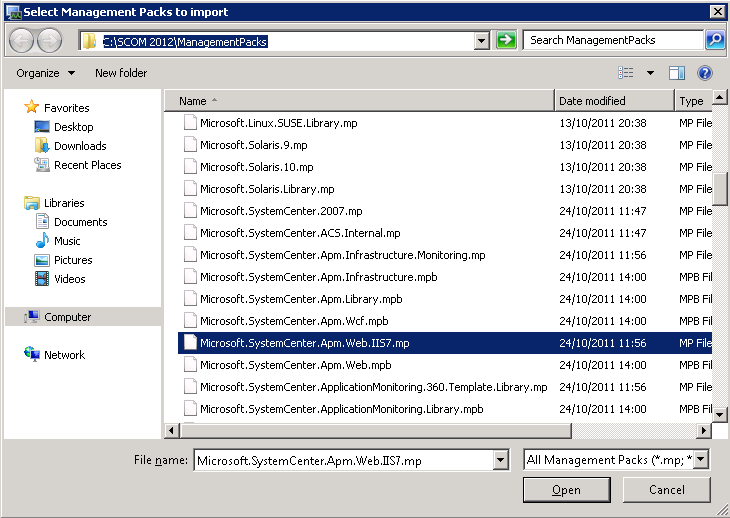 This management pack file is titled ‘Microsoft.SystemCenter.Apm.Web.IIS7.mp’ and is located in the ‘Management Packs’ folder of the installation media. 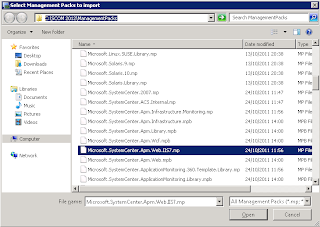 Once you have these two management packs imported, you then need to ensure you have some .NET applications that you can monitor! 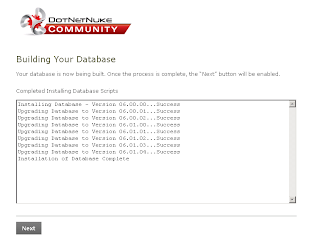 If you are looking to deploy this functionality for testing/demo purposes, then you can download some of the free .NET applications that are available from the general community such as ‘DotNetNuke’, ‘DinnerNow’ and ‘BlogEngine’. 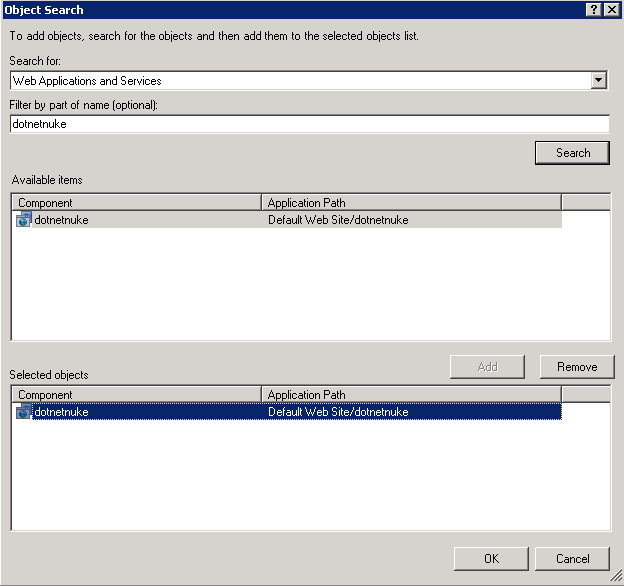 If you already have in place your .NET applications to be monitored, then you can skip past the DotNetNuke deployment section and move to Part 2 of this series. 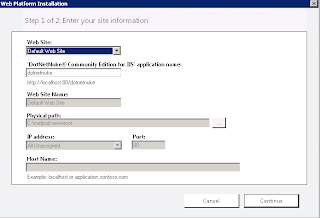 I really like this application simply because the installation of it is so easy as it uses the Microsoft Web Platform Installer 3.0. 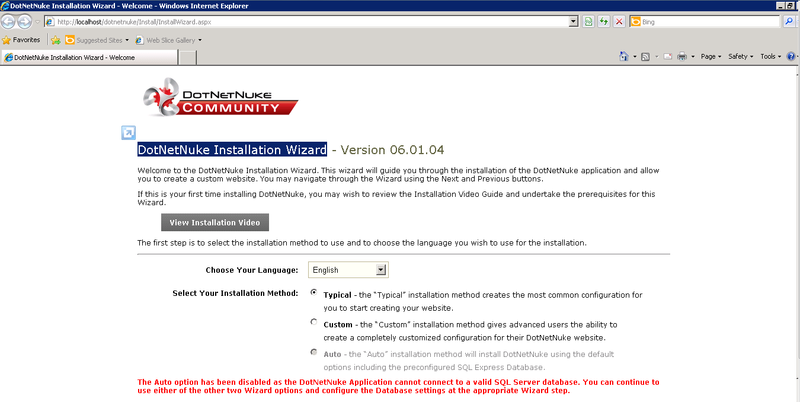 The screenshot below shows the installer window for the DotNetNuke application web infrastructure. 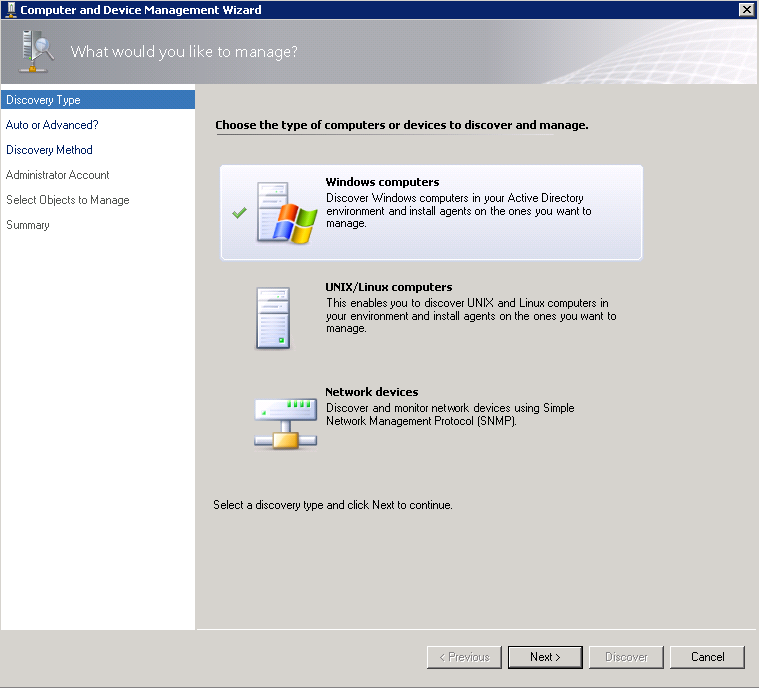 When you click on the Install button, you will be presented with a number of options and pre-requisite checks. 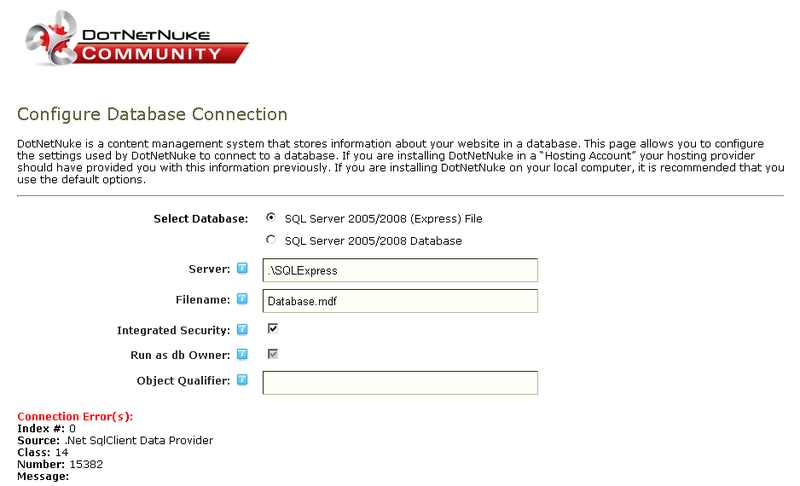 If you don’t have SQL installed, then the installer will download SQL Express and deploy it to your server. 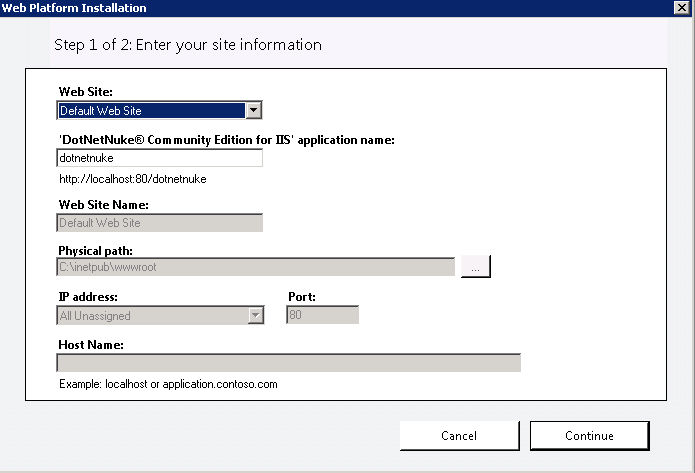 During the installation wizard, we can choose the IIS website that we want to deploy the application to or even create our own website as part of the process - nice and handy! 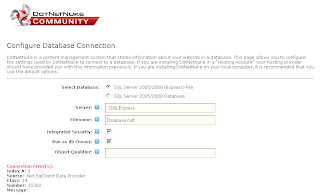 If you choose the Typical option and click through the wizard, you might come to the screen below where it is asking you to choose your SQL database type. 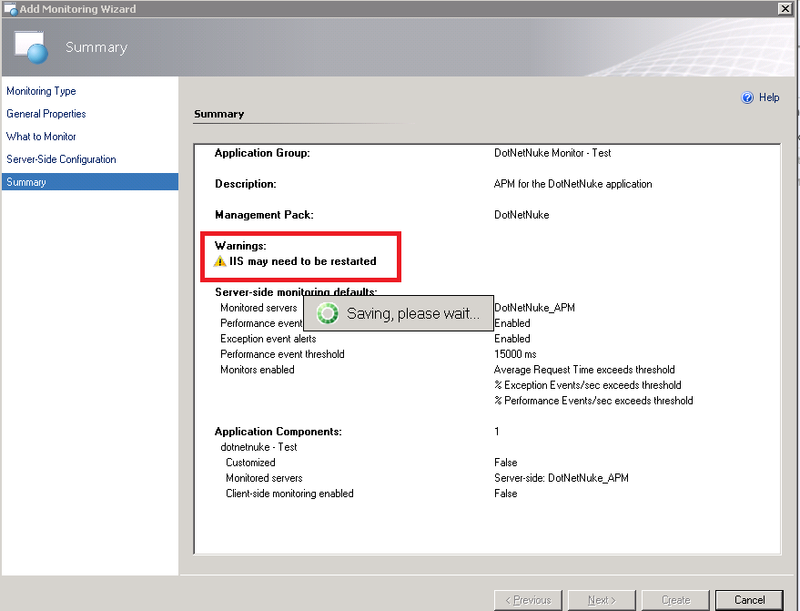 If you try to click Next whilst leaving the default settings specified, you will get the error message below - which is kind of cryptic to us non-developer types! 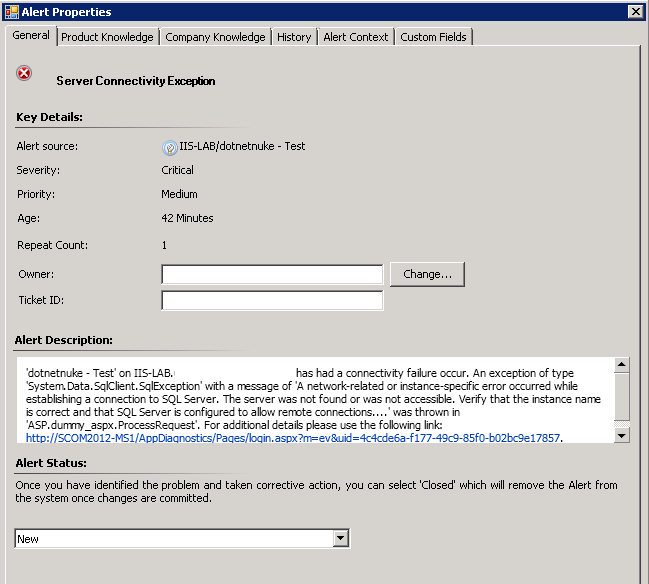 The error above basically means that the credentials being used to connect to the database (in this case the SQL Express database) do not have sufficient permissions to it. 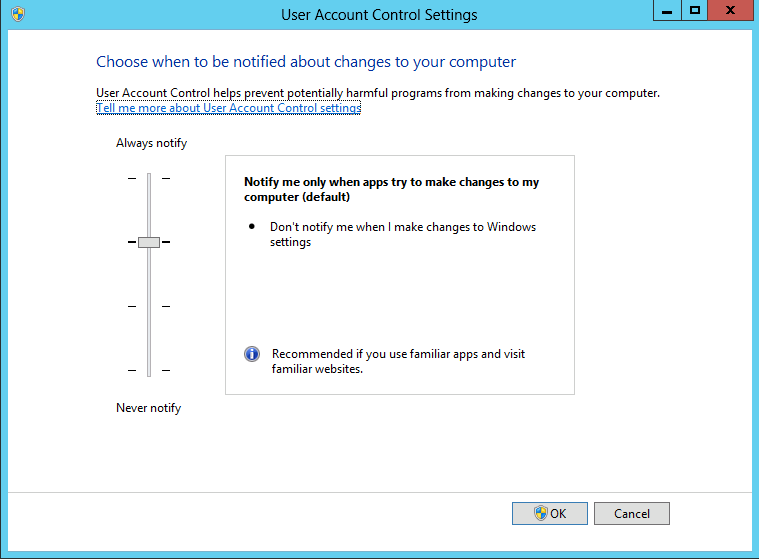 Follow the instructions in the video that I’ve linked above to allow your account permissions on the DB and you should be able to continue on. 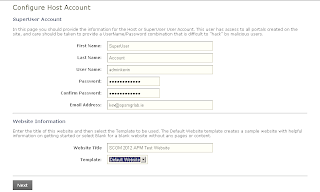 Click Next from the screen above and you will be presented with the Configure Host Account window where you need to specify a SuperUser account that will have full admin access to your new website. 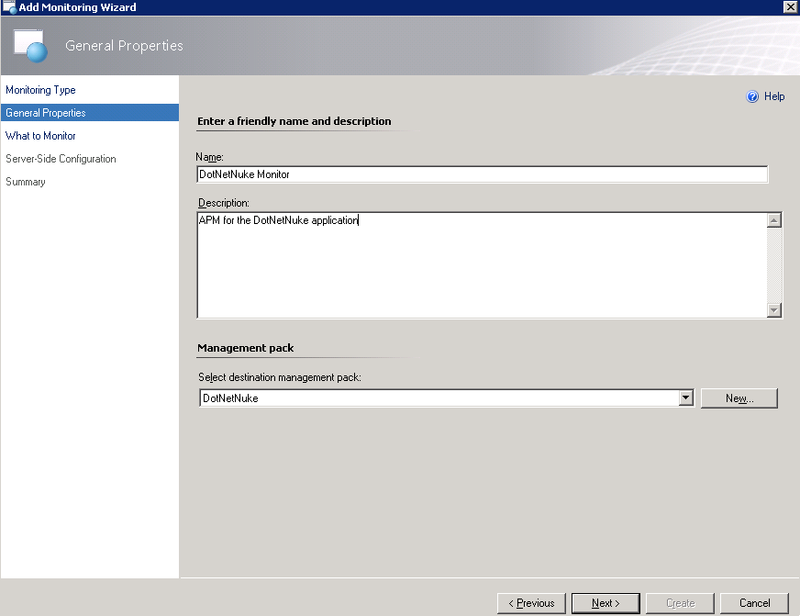 Once the wizard is finished, you will be presented with your newly created website like the screen below - complete with a backend .NET application that we will configure for Application Performance Monitoring with SCOM 2012. 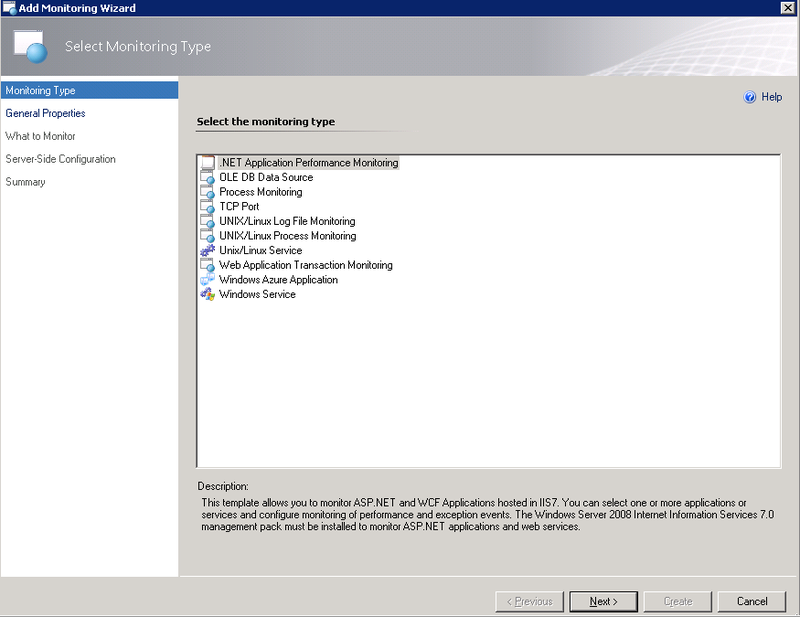 In Part 2 of this series, I will go through the process of monitoring the new application with SCOM 2012. 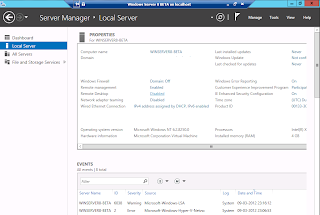 In Part 1 of this two part blog series, I walked through the process of installing the Windows Server 8 BETA onto a virtual Hyper-V machine. 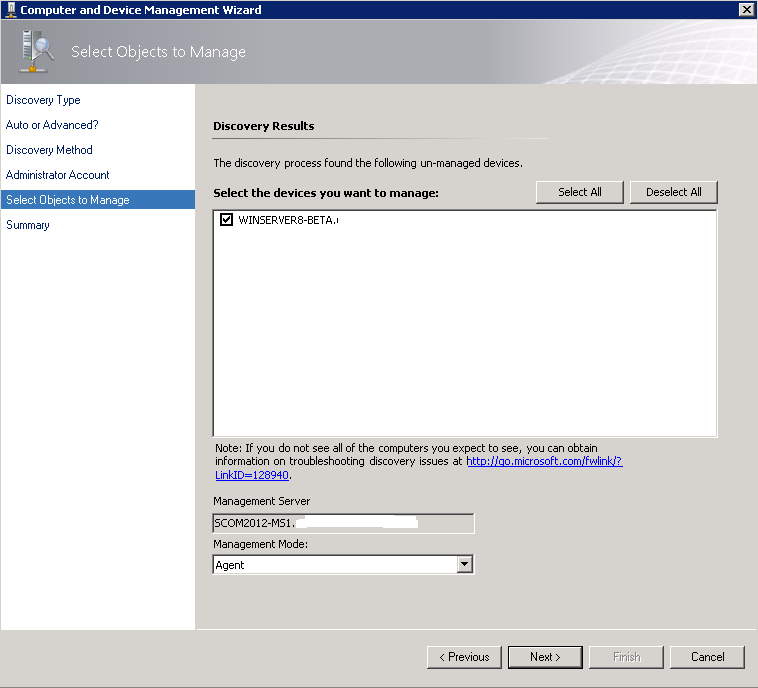 In this post, I'll describe how to install the SCOM 2012 agent onto it and show it being managed and monitored within the SCOM console. 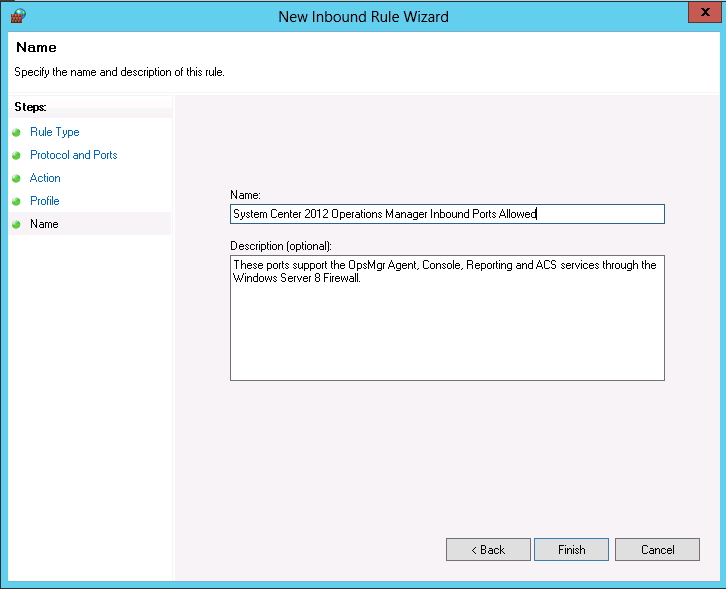 Before you start on the SCOM side of things, a couple of points to note. 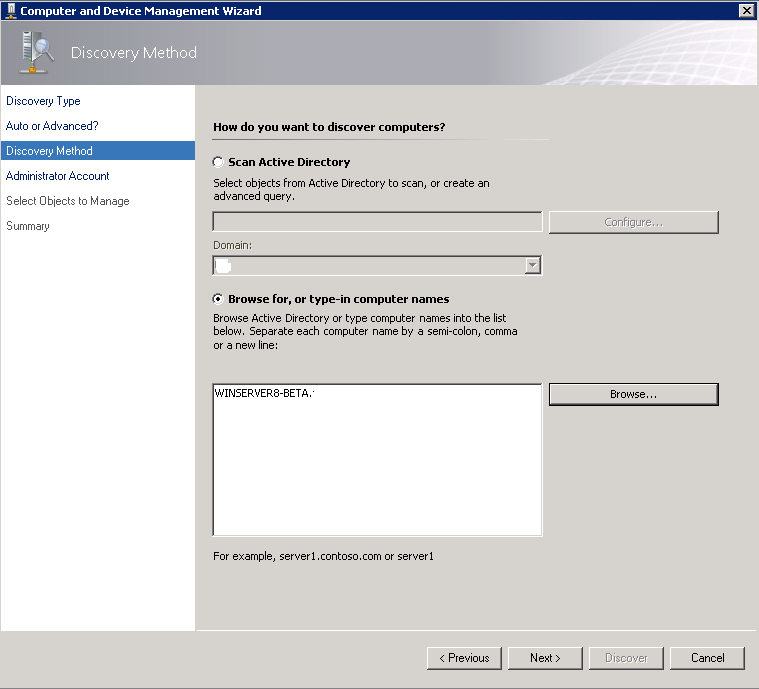 The Windows Server 8 machine is best off being a member of an Active Directory domain as it avoids having to manually install the SCOM agent. 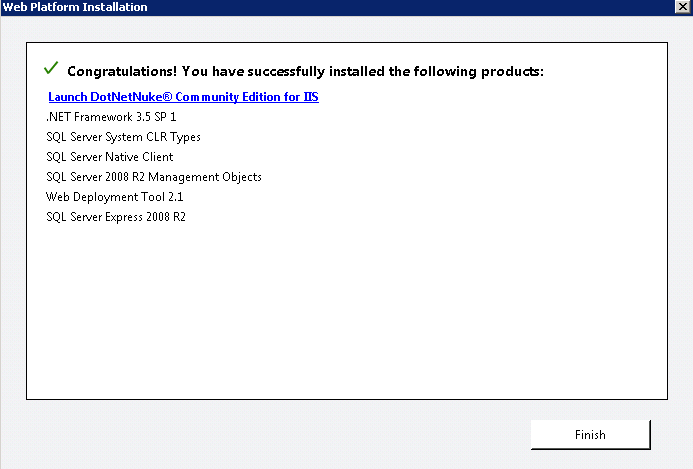 Note: It is a pre-requisite to have the .NET Framework 3.5 feature installed first before you go and install the agent. 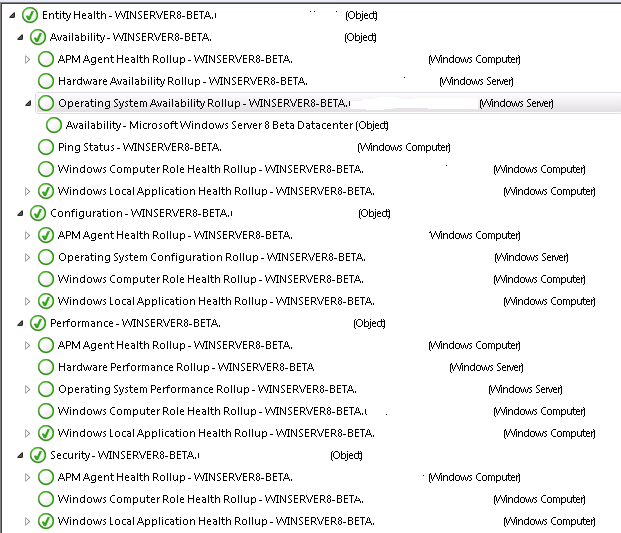 Quite a few people have been commenting (see below) on coming across errors with agent deployment and the solution is to install this feature. 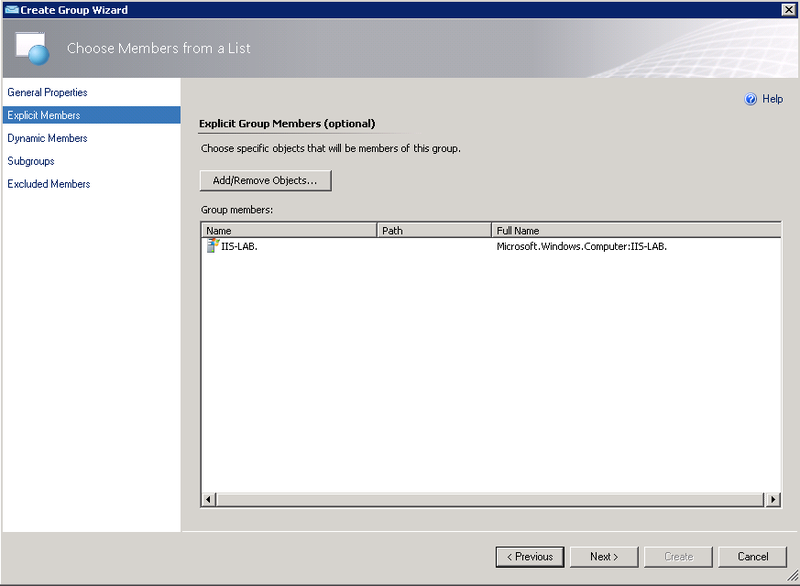 Post Update 12.03.2012: A good friend of mine (whose technical opinion I've a lot of respect for), commented to me that there's no point in having this shiny new secure operating system if you're gonna go disabling the windows firewall and UAC on it as it wouldn't be something we'd do in a production environment anyway for obvious security reasons. 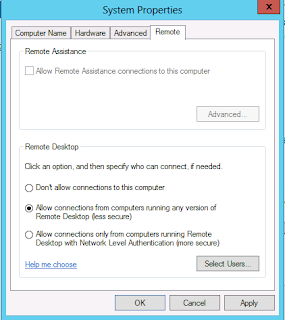 I totally agree with him and put my initial suggestion of disabling both these security features down to a combination of eagerness to get the solution working and tiredness when I orginally wrote up the post. 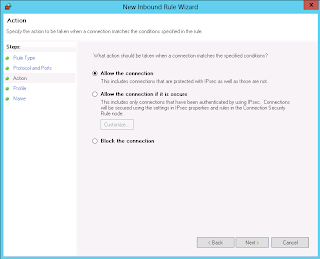 As a result, I've amended the following sections below that state there's a need to turn off the firewall and I've added in the correct steps to take to get it working in a secure and firewalled environment. 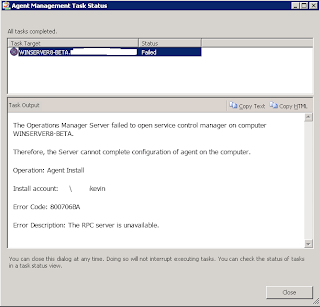 When I tried to initially install the SCOM agent on a vanilla install of Windows Server 8 (with the server in a domain)it failed. 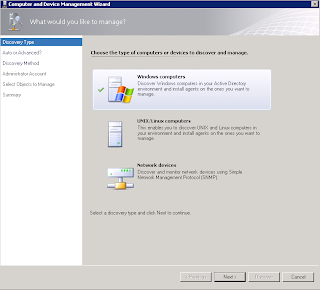 I had to turn of User Account Control first and then disable the Windows Firewall in the Windows Server 8 OS. 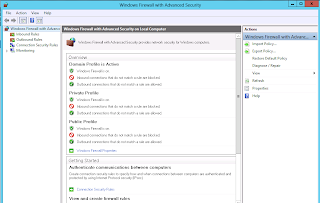 The screens below show the UAC and firewall settings needed to make the agent install work. 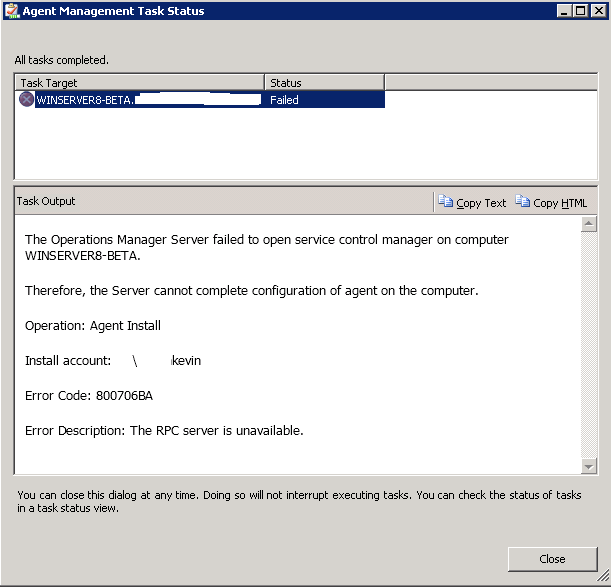 The reason for this failure was the secure out-of-box configuration of the windows firewall and some modifications need to be made to allow the agent to install. 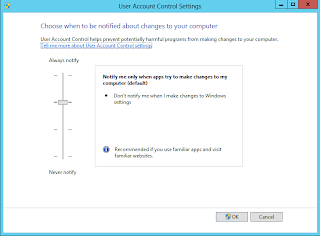 You can leave User Account Control (UAC) turned on as it doesn't affect the agent deployment. 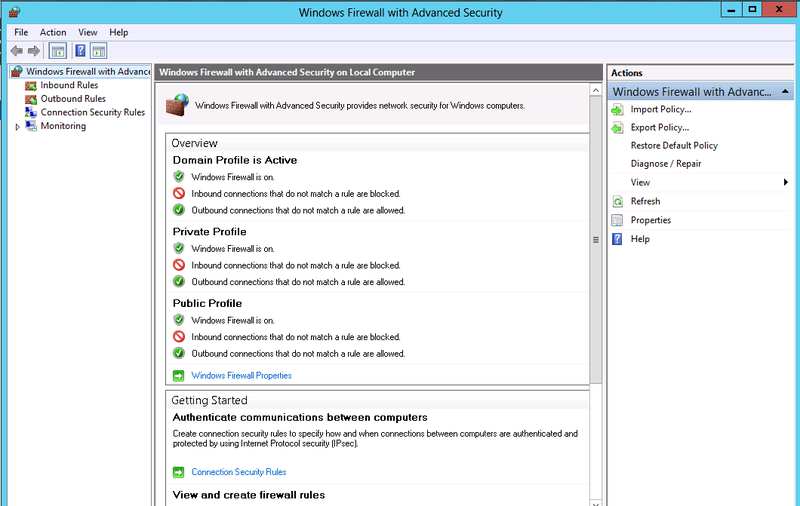 The screens below show the windows firewall enabled and the default UAC setting within the Windows Server 8 Operating System. 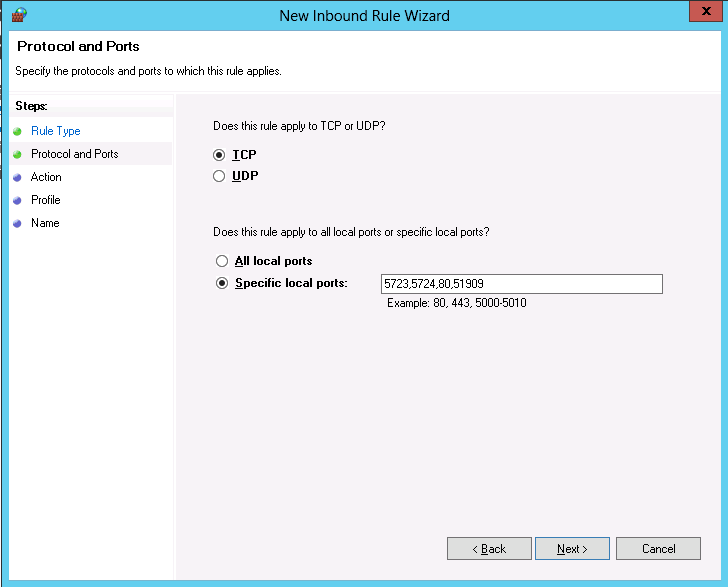 Select TCP and then type in the specific ports that you want to allow - in this example, I've used 5723,5724,80 and 51909 as I will most likely be installing the SCOM Console on this server at some point so want to provision for that now. 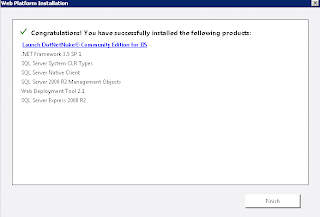 Click Next once you're finished your selection. 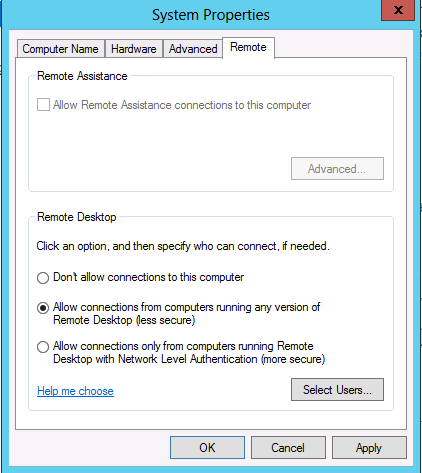 The final step you need to take here (and this is what catches people out when trying to configure this-I know it caught me! 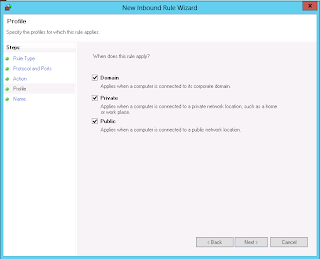 ), is to enable the already created rules for File and Print Sharing and WMI from within the Firewall Console. 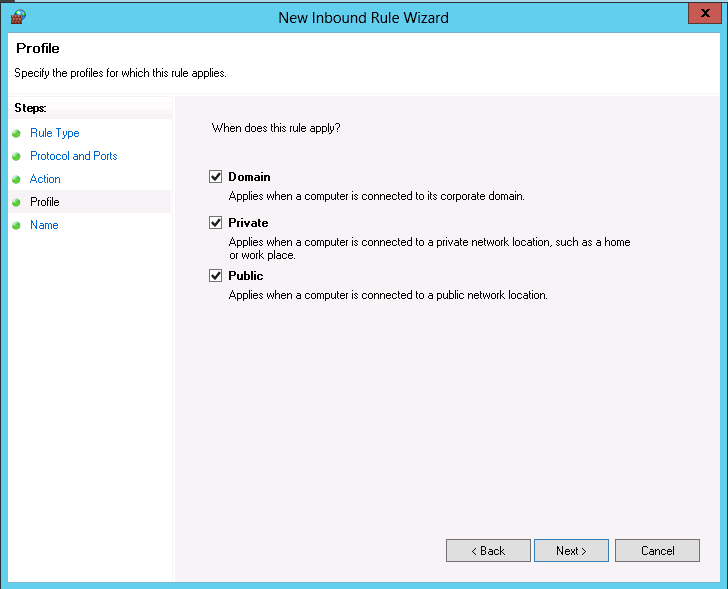 Although these rules are already existent in your firewall configuration, they are disabled by default and need to be turned on for the SCOM push installer to actually run. 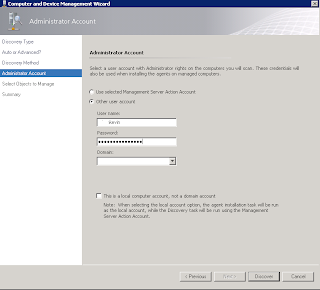 Once you have UAC and the firewall turned off configured the firewall with the relevant ports allowed, you can then start the installation of the SCOM agent. 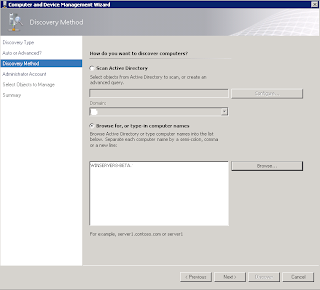 To begin installing the SCOM agent, click on the Administration tab in the SCOM console and then select the 'Discovery Wizard' option located at the menu on the left hand side. 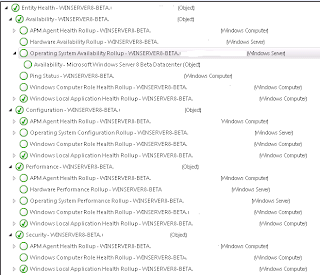 Obviously, there will be a number of things not working on this agent and when we go into the Health Explorer for it, we can see that all of the Operating System rollups are in a Not Monitored state. 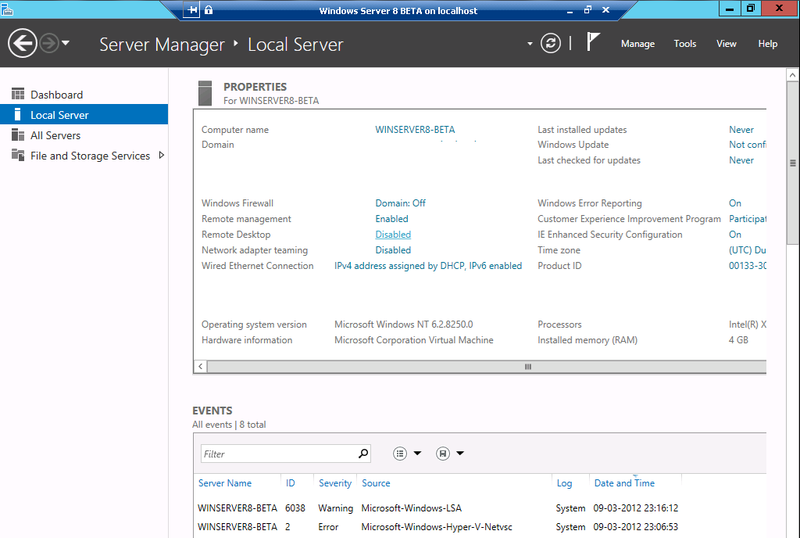 This is to be expected when we haven't yet got a management pack released for Windows Server 8. 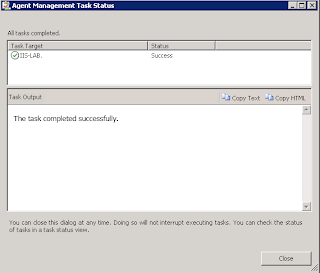 This concludes the installation of Windows Server 8 and the deployment of the SCOM 2012 agent to it. 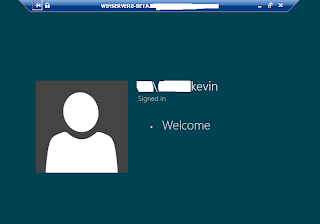 Hopefully you've enjoyed this short exploratory series!